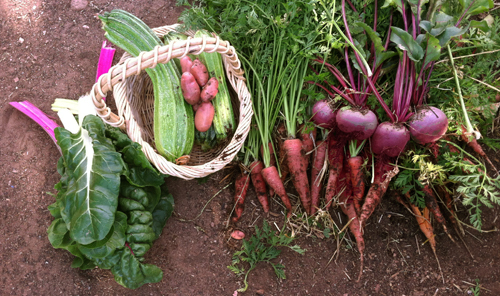 Here is my review of what I will and won’t grow again from last year’s vegetables that I tried and why. 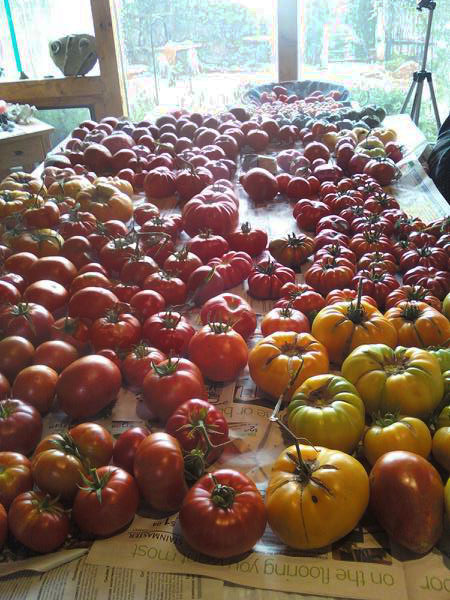 I will put tomatoes in another list since there are so many of them! -Tarbais bean/pole-dry bean-after much work FINDING IT last year in the states, you can now get this wonderful bean from Baker Creek Heirloom Seeds this year. I will make a french dish called cassoulet with it. 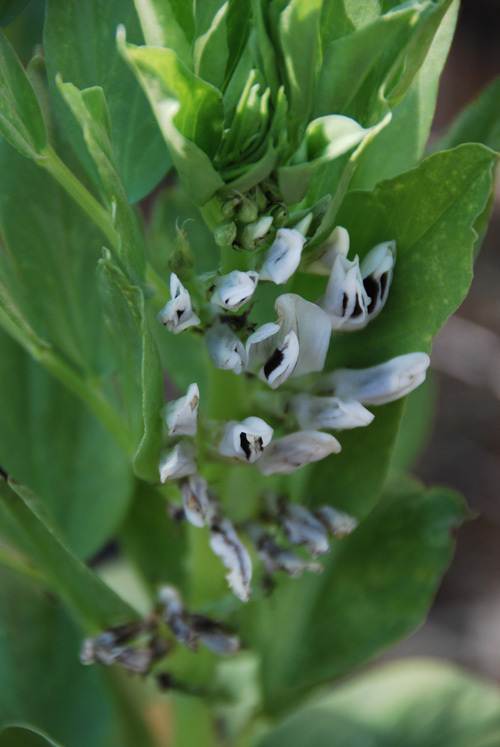 -Fava Bean/bush-wonderful flavor and 2 crops last year. A little work shelling it twice but worth it. Also is a good cover crop replenishing the soil with nitrogen. POTATOES–first year grower and I’m hooked! -French Fingerling-OMG, the best flavor! SUNFLOWERS-technically a flower but they are veggies for the birds! TOMATILLO-Green-good for tomatillo salsa-only need one plant as they are so prolific. BEAN-Emerite bean/pole bean- great flavor but didn’t grow high enough to cover my teepee and I will grow others this year. -seed from local grower-turns out it was a native winter squash, not calabacitas squash. -Di Firenze-might grow one or two but not 25 plants like last year! -Jalapeno-I don’t use them enough to call for space in the garden. I’ll just buy the few I use throughout the year. I’ve been busy in the garden! It is ALMOST finished. 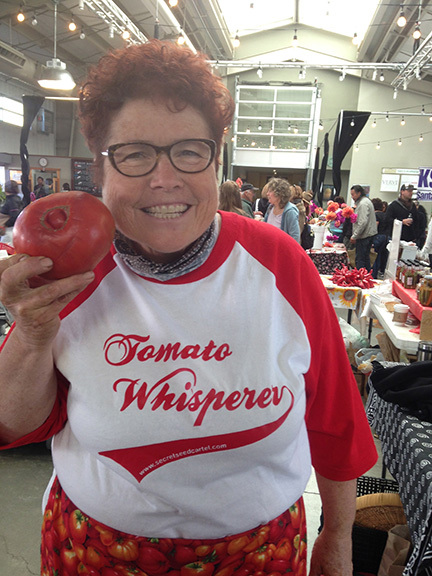 I have 8 more tomatoes to plant tomorrow that I forgot to get that are some of my standards at the SF Farmer’s Market. OPPS! But they will be ready in time. The fava beans are looking good. Here they are flowering. I like the black and white flowers. I don’t think I’ve ever seen black and white flowers on a plant before. They had some aphids so I sprayed them with insecticidal soap and they are looking better. They have baby fava beans on them now. 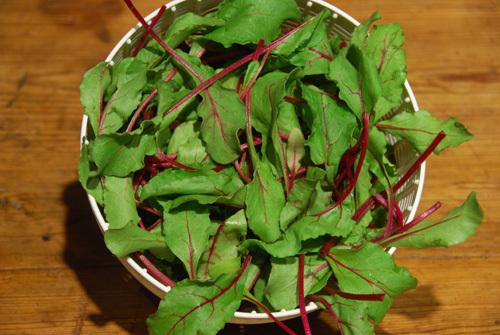 Here are some beet greens I harvested while thinning out the beets to give them room to grow. They are yummy in a salad and are so beautiful. 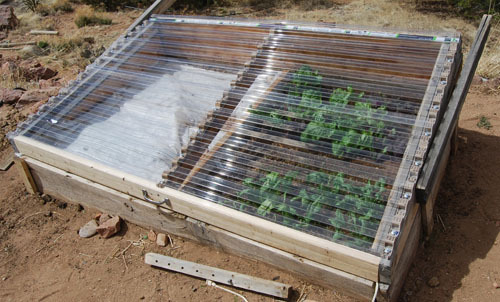 In the shadiest part of the garden I planted some bok choi and lettuce and have had it covered with row cover since planting to help keep them from the heat and bugs. They both are looking great. I’ve never grown bok choi before so I’ll have to research when to harvest as they are getting to be pretty big and won’t like the heat for too long. 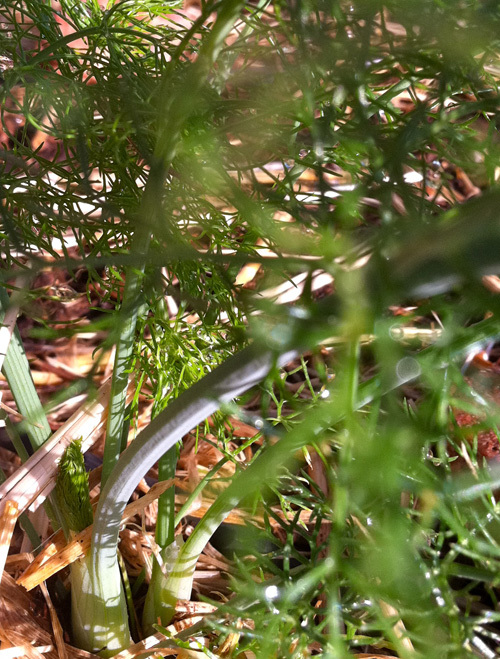 The fennel bulbs are getting bigger and are almost ready to harvest. Maybe another 2 weeks. They also won’t do well in the heat. I wonder if they will get as big as the ones in the grocery store..
About half of the tomatoes I previously planted are growing out of the top of the wall of waters and I need to take them off before it gets too difficult. It’s been fun growing some early stuff. 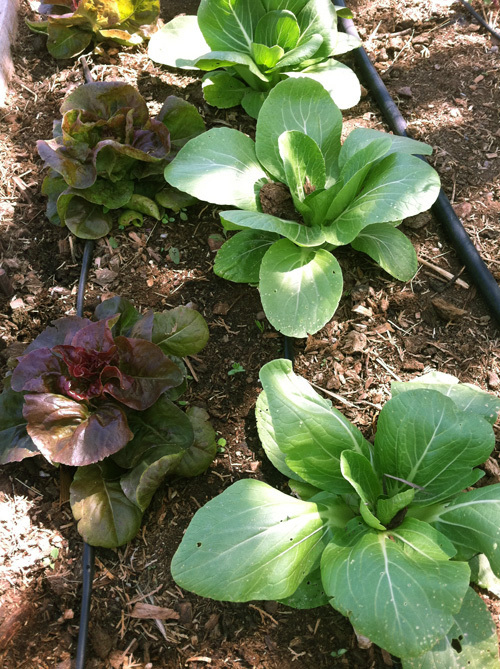 The bok choi, fava beans, fennel and lettuce are more cool season crops and will have to be harvested soon because of the heat. Probably all of them will be harvested BEFORE July. I also have potatoes that are growing through the roof, strawberries that are being harvested and rhubarb that is ready to pick but will save that for other posts. 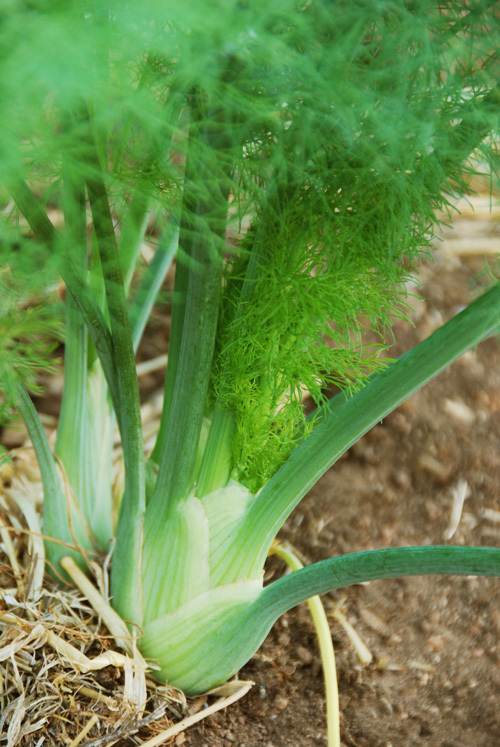 More on another new vegetable I’m trying this year-Finocchio Fennel. There are several types of fennel, the bulb type (which is Italian called Finocchio or Florence), sweet fennel (fern like) and bronze fennel (fern like). 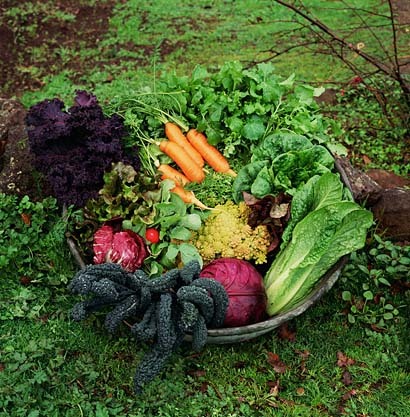 All can be used as an herb but sweet and bronze are used for their foliage in cooking and Finocchio or Florence is used for the bulb in cooking. 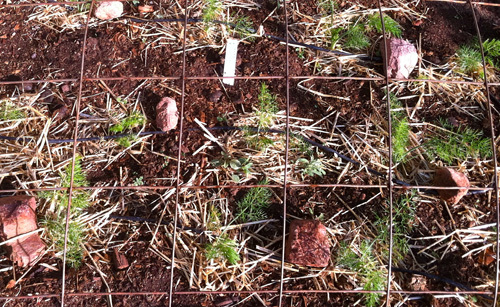 Sweet or bronze fennel will not bulb up. 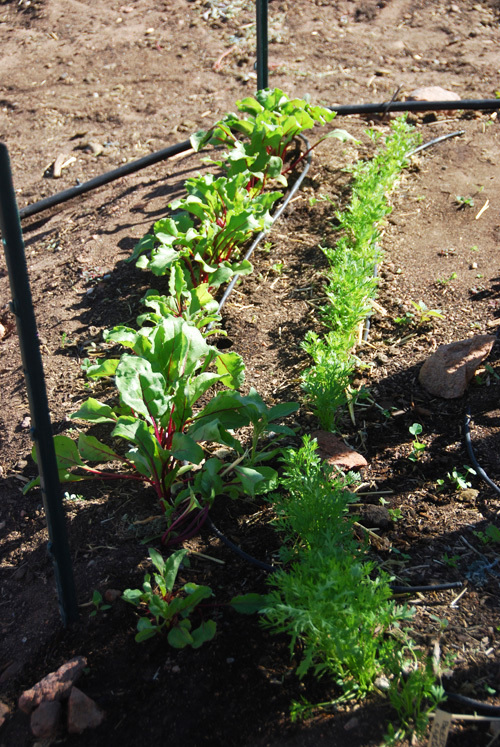 I used Finocchio in a Cioppino (seafood stew) at New Year’s and it was so wonderful that I decided to grow some. 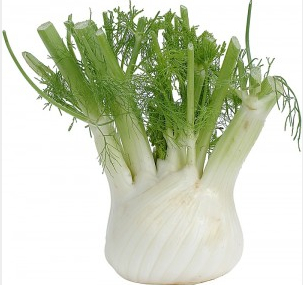 This post is about Finocchio Fennel. 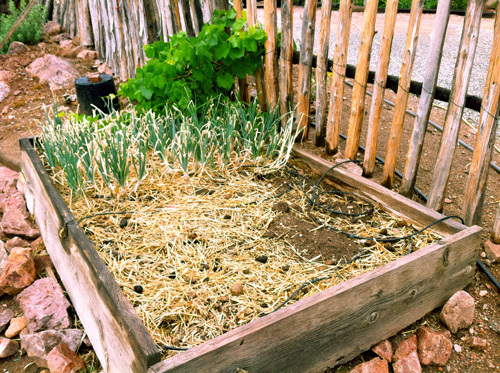 I tried to grow some inside from seed- it didn’t do very well only getting a few to germinate so I ended up I buying a little pack at Agua Fria nursery here in Santa Fe. Now from from what I’ve read they are not suppose to transplant well in the soil but I had so many of them in each little cell (and they were very young) that I teased the roots apart (carefully) and transplanted them directly into the soil. 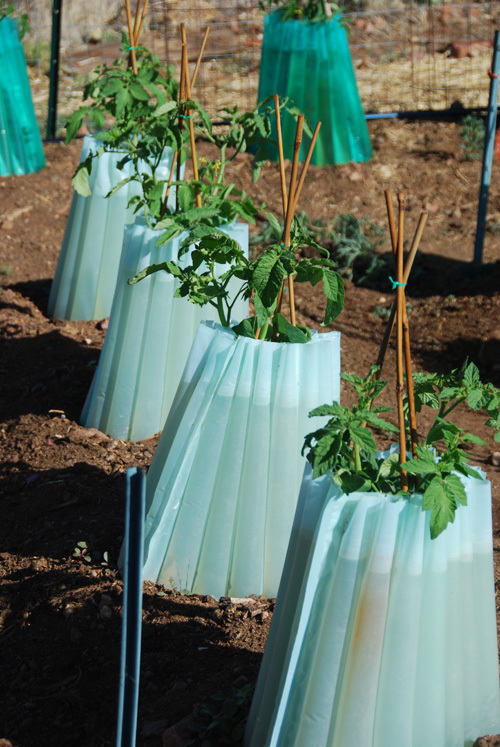 I then put a drip on each one, made a little well that I put straw in so the water would not evaporate and then I put a cage I made out of wire material and covered it with some row cover. I was afraid the row cover might be too heavy directly on the baby fennels at first as they were very delicate-hence the cage. I thought the row cover would add more protection from the wind. Fennel can handle the cold (in fact it likes it) but the wind was what I was worried about. Here is a picture of the one of them developing bulbs. All 17 of them are doing really well.